I felt optimistic as I climbed the steep hill leading up to campus for my first day of school. I am attending the Corlone campus – one “e” away from being Nice’s mob school- which houses the languages department of Nice University. 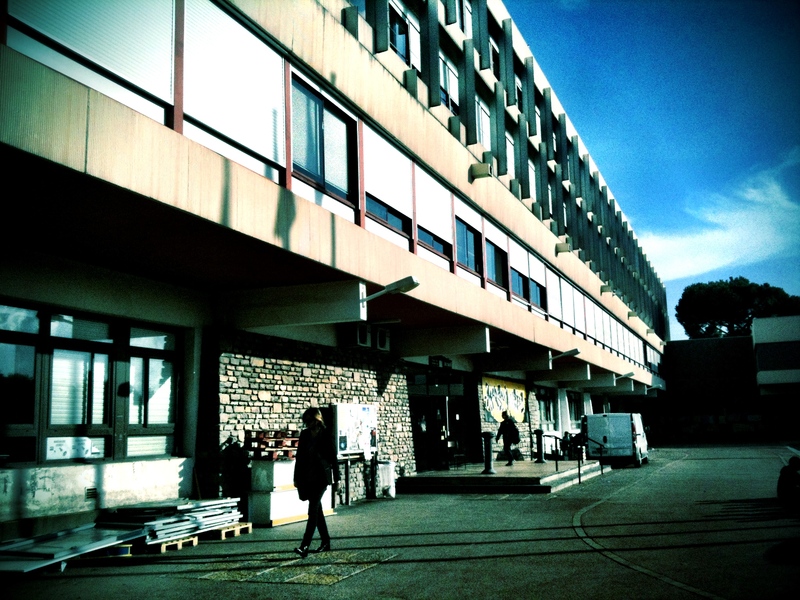 The Faculty of Lettres, or le fac as it is called, consists of a few squat, rectangular, concrete buildings that border an expansive quad. When I arrived there were about 60 students mingling and chatting, waiting for their classes to start. It was already 10 minutes to 9:00 and I wasn’t sure where my classroom was, so I made my way through the crowd into the main building and ran up the steps to the second floor to room 230: Le Bureau des étudiants étranger. I still find it a little startling when someone asks me if I am an étudiant étranger. I know that is just the word for foreign but it sounds almost rude in French: like they are saying they find me personally strange. I guess I am still getting used to being a foreigner. Outside of the office I joined a group of students huddled around a glass case on the wall where our class lists were displayed on a bulletin board. I found my name and saw that my class didn’t start until 1:00 pm so I had a few hours to kill. I took a little tour of the school, perused the cafeteria and the vending machine selection and found the quietest spots in the library. 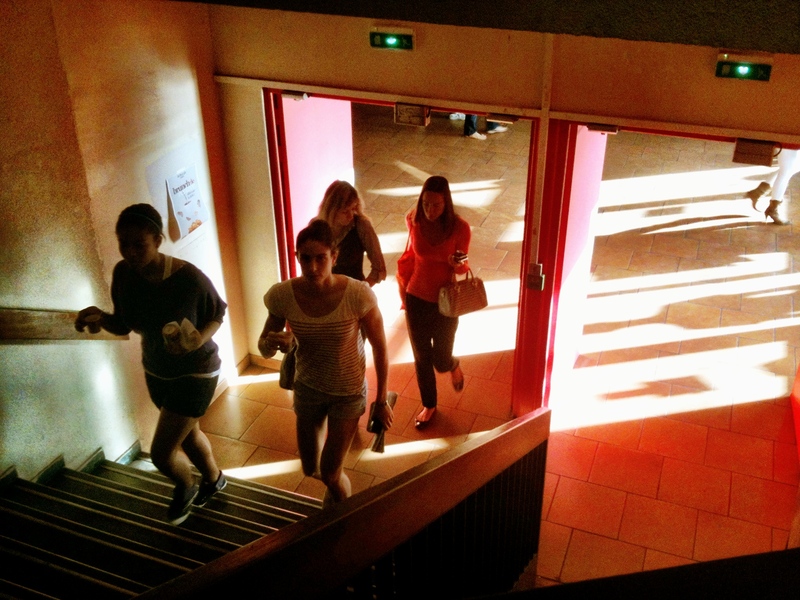 I went to the sports complex and signed up to take yoga classes (in French!). So far I can report that long hair, patterned jeans and hand rolled cigarettes are in this season. It’s funny how college campuses all kind of feel the same. I spent three very happy years traipsing around UC Santa Cruz and I couldn’t help noticing some similarities here. 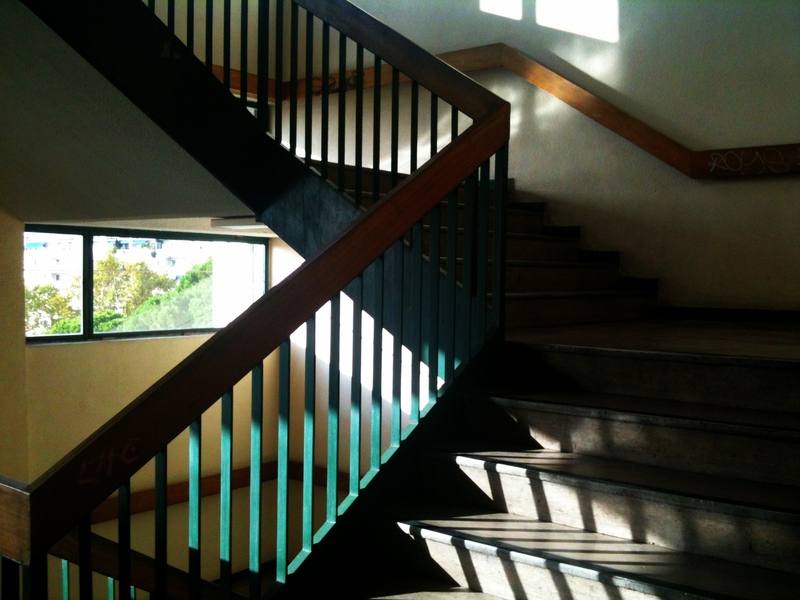 UCSC’s McHenrry library with its 1970’s décor and endlessly comforting smell will always be one of my favorite places. The Bibliotheque at Corlone isn’t quite as grand, but it has the same wonderful library smell of ink and paper and clean books. And it has the same peaceful, calming quiet that gets inside you as soon as you walk through the doors. Corlone doesn’t really compare to SC Santa Cruz – which must be one of the most stunning universities in the world; the towering redwoods, beautiful views and creative architecture are hard to measure up to, but this place has its charms too. Both campuses are perched up on top of a hill overlooking the ocean. All of the classrooms on one side of the main building on the Corlone campus have clear views of the Mediterranean stretching out below. When 1:00 pm finally rolled around I shuffled into the classroom with all the other students, got out my notebook and my pen and settled into my seat as the teacher started calling roll. She made it though the A’s and the B’s and the C’s and I started to feel a nervous knot forming in my stomach. She got through all of the names without calling mine and then asked everyone to get out their student ID’s. By this point I was feeling more than a little lost. I could only understand every third word or so, I was pretty sure I was in the wrong class, and I definitely didn’t have a student ID or know where to get one. After a few minutes of sitting there like an idiot, I quietly packed up my stuff and exited the room. I looked on the outside of the door and realized that I had been sitting in room 235b instead of 236 where I was supposed to be. I walked down the hall to room 236 and opened the door to find an empty room. Utterly confused, I went and double-checked the class schedule where I realized that in my haste earlier that morning I hadn’t read it correctly. If I had I would have seen that I only have class four days and week – and none on Wednesday so not only had I been in the wrong class in the wrong room, but I was there on wrong day all together. Feeling like a complete fool, I trudged down to the bus stop and stepped into the most miserably crowded, hot, stuffy, city bus I’ve ever encountered. I tried to move towards the back to make room but we were packed in so tight it was all I could do to find a place on the metal bar to hold on to. As we jerked away from the curb I could feel myself sweating in my cardigan and started feeling claustrophobic. I decided to get off at the next stop and walk home, fearing I might have a panic attack if I stayed put. I managed to push through the passengers and escape into the freedom of the sidewalk and as soon as the doors shut behind me I heard a loud crack and the skies opened above me. In an instant I found myself standing sans umbrella in the middle of a full-blown thunderstorm complete with driving rain and lightning. I saw a phone booth across the street so I went inside to wait out the downpour and call the Englishman for moral support. Thankfully I got through and managed to blurt out the key points of what was fast becoming a very bad day before I heard my phone beeping to say it was running out of batteries. Perfect. I stood in the phone booth for a while hoping the rain might let up, but the sheets of water just kept coming and I was already drenched so I decided I might as well soldier through. The next 20 minutes were surreal, my glasses were simultaneously fogged up and covered in water droplets rendering them useless, so I stepped blindly through puddles that came up past my ankles and into what felt like a hose pointed directly at me. I tired not to take too much notice of all of the dry people inside the various restaurants and cafes and bakeries I passed, who were looking at me with faces that I think were more mocking than the empathetic. I finally made it back to the apartment, where I left a wet trail of foot print sized puddles though the foyer and in the elevator and in front of my door. I pushed through into the hallway, stripped off my sopping wet clothes, ran a hot bath and tried to let the day melt away as the warm water rose up around me in the tub. Luckily things went better the following day. 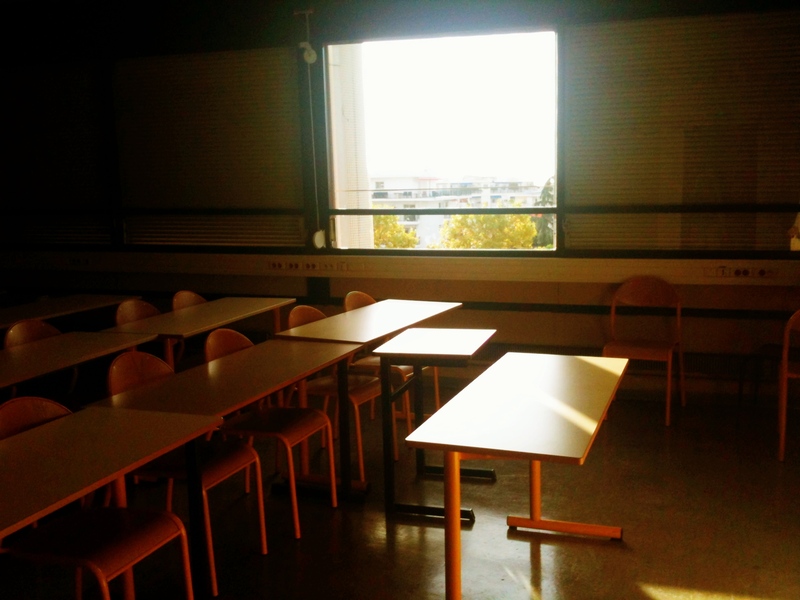 I managed to find the right classroom for starters, and my class is filled with what seem to be a cast of interesting characters from all over the world. Spain, Morocco, the UK, Japan, Turkey, and China are all represented, (and two girls whose nationalities I can’t quite place). And better yet, they all seem to have about the same hopeless level of French as me! The teacher is fantastic and even though I pretty much sound like a complete imbecile every time I open my mouth, I am really enjoying being back in school and trying to speak French. I figured out where to get my ID card so things are definitely looking up. I have realized that I am very glad do be doing this now. I don’t think my younger, less self-assured, self would have fared as well. You have to have a pretty strong foundation to be able to make a complete fool of yourself every day and not lose the will to live. But skulking out of room 235b was a low point, even for me. I loved this post! I could feel the frustration and anxiety. 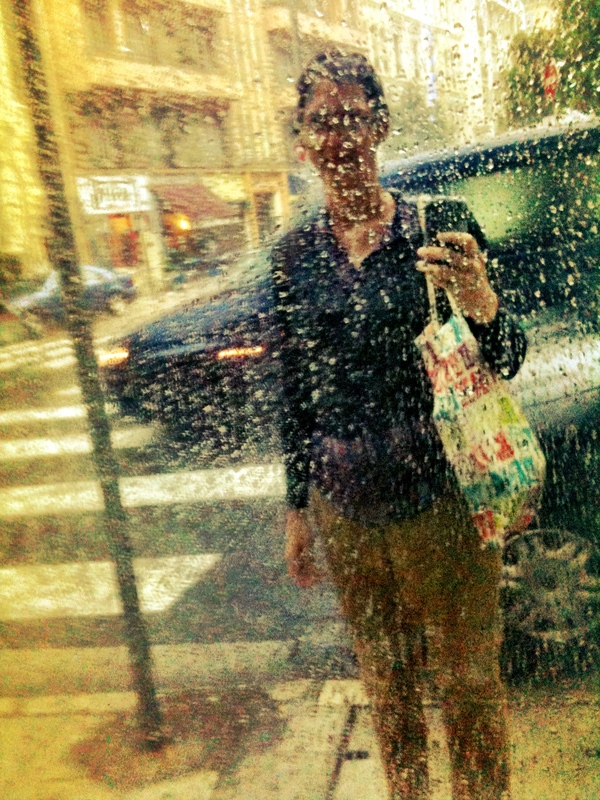 I thought it was so cool that even though it was a very bad day, you were thinking about your story and even memorialized it with your drenched picture. What a day, but how well it just have prepared you for day two, the yoga sounds like it might be a great help too. Lucky you having a bath in your apartment! Yes! I am hoping the yoga will help with vocabulary and grammer a bit. The tub is an absolute godsend in the winter! thanks for the encouragement Claire!